All the goodness of avocados in a quick and delicious tuna salad! I was looking for a quick lunch today. I wanted tuna salad, but I didn’t have any homemade mayonnaise in the fridge and didn’t feel like making any. I always have avocados on the countertop and lemons in the fruit drawer. This Tuna and Avocado Salad is made up of pantry/fridge staples, so it can be a quick go to meal for two, or provide a tasty lunch for a couple of days! I threw my half of this salad on some mixed baby greens, but Alex ate his straight out of the bowl! As a side note: I ♥ avocados! I love the flavor, texture, versatility, even the color! They are a great source of monounsaturated fat and a number of vitamins and minerals. Check out the California Avocados website for more on the nutrition facts and health benefits of avocados. Combine all of the above ingredients in a bowl. Using a spoon or fork, gently break up the tuna into little pieces. The avocado will mash slightly, but you will still have some larger chunks dispersed throughout the salad. Check for seasoning – I used 2 pinches of sea salt and 3 grinds of pepper and it was perfect for our taste! 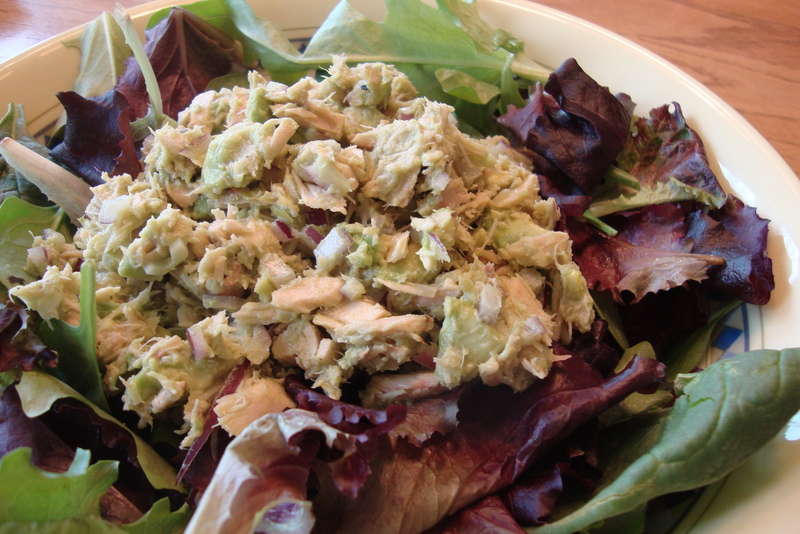 Top mixed baby greens with the tuna salad or eat it plain! Lunch in no time flat! This recipe was shared at Food Renegade. Avocado, Lemon, Onions, Tuna. Bookmark.